With the new school year just around the corner, homeschool planning is in full swing for many moms this month. It is an exciting time to be shopping for curriculum, figuring out schedules, and hitting the school supply aisles. This time of year can also be overwhelming when it comes to setting goals and mapping out school days. Homeschool moms have special needs when it comes to planning resources. The A+ Homeschool Planner from Amy Sharony is a unique planner for up to 6 students. It makes homeschool planning a breeze for busy moms who want a user-friendly and customizable resource. The A+ Homeschool Planner contains sections for planning lessons for up to six children. There are pages for yearly, monthly, and weekly planning. The author provides guidance for setting goals, along with pages for personal and academic goal setting and accountability. Each weekly section also includes pages for grades and extras, like recording books read, nature studies, field rips, or other special projects. As a homeschool mom of sixteen years, I have tried several planning methods over the years, and I am pretty picky when it comes to the aesthetics and format of my planner. I don’t want a lot of bells and whistles, but mainly, I want something that has the functionality I need and the space I need without my having to cross things out to make it work for me. The A+ Homeschool Planner delivers on all counts for me. While most homeschool planners come in a spiral bound format, The A+ Planner features a softcover bound format. It is a large book, with a real spine, so it fits nicely on my bookshelf. I love this feature, because the book is sturdy enough to schlep around in my tote, and it looks nice on my shelf. Since I save my planners from year-to-year, the binding of this planner is a huge plus for me. The color scheme is also one of my favorite aesthetic features of this planner and makes it enjoyable to spend time using it. The pages are heavy high-quality cardstock, with color-coding and full-color on each page. The monthly pages are in a separate section, making it easy to get an overview of your year, while the weekly pages are in a separate section for easy day-to-day planning. There are motivational quotes and tips on each page, and they usually come at the perfect time for the boost I need. This is a secular planner, so the quotes are from an eclectic variety of sources. 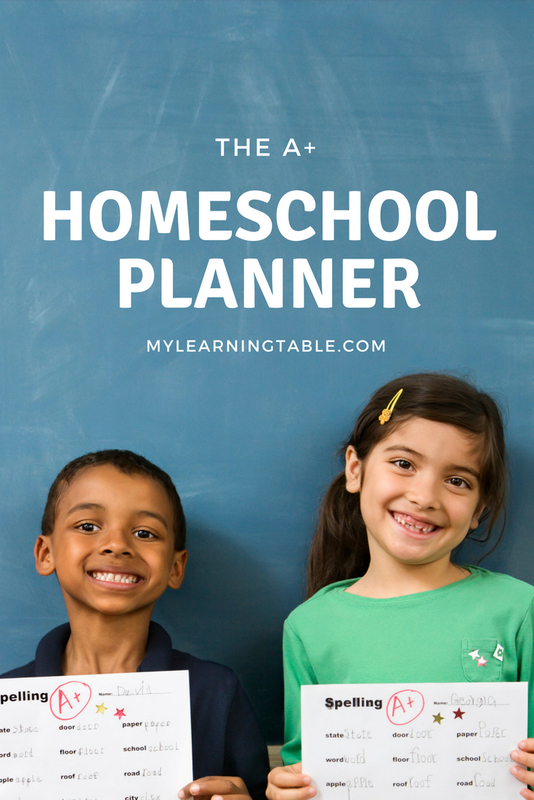 I am not much of an advance planner, and I like how easy it is to journal as I go in The A+ Homeschool Planner. But for those who would rather plan ahead, it is especially easy with the author’s tips and examples. Most states’ homeschool laws require keeping a plan book or lesson planner for end of year accountability. Give this one a look, and you won’t be disappointed. In addition, for homeschooling middle and high school, the format of The A+ Homeschool Planner is ideal for transferring information onto your student’s transcript. I wish I had discovered this planner sooner in our homeschool journey, and I look forward to using it. The publisher provided a review copy of The A+ Homeschool Planner.